One of the newest condensing boilers to come from Bryan Boiler is the Triple-Flex Ultra-High Efficiency Condensing Boiler. This patent pending condensing boiler comes with flexible stainless steel tubes as well as 90% energy efficiency with a 160 degree return. 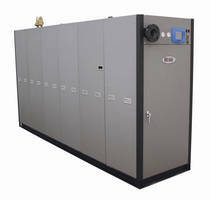 This is one of the most effective and efficient condenser boilers in the commercial sector. Bryan Boilers started their business in 1916; they began their business selling steam powered tractors. Since gas engine was born, the need for gas became the fuel of choice. In 1922, they stopped producing for the steam tractor and began providing boilers. Bryan Boilers has since created hundreds of different models of boilers but their newest, the Triple-Flex Ultra-High Efficiency Condensing Boiler is clearly a more effective and more efficient way to provide heat for today’s demanding gas applications. The Triple-Flex Ultra-High Efficiency Condensing Boiler from Bryan Boiler offers a one of a kind three pass design that is locate d in the combustion as well as the convection section. This triple bypass system will allow better fireside heat transfer. The gases will then travel through the combustion air pre-heater which is where the boiler will recover the free heat that on other condensing boilers would be going through the stack. 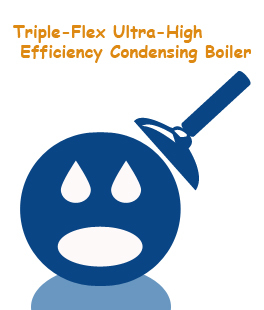 The Triple-Flex Ultra-High Efficiency Condensing Boiler provides maximum efficiency through this unique system. There are 4 different sizes to choose from. The Models TF 500 has an Input rating of 1,500,000, the Model TF 200 has an Input Rating of 2,000,000, the Model TF 250 has an Input Rating of 2,500,000 and the TF 300 has an Input Rating of 3,000,000. These units have an output efficiency of 90%. Some of the standard equipment found on the Triple-Flex Ultra-High Efficiency Condensing Boiler is the safety relief valve, the operator control and the temperature and pressure gauge. On these boilers is a high limit, which will control the low water cutoff switch as well as the manual reset. On the control center of the Triple-Flex Ultra-High Efficiency Condensing Boiler is the Honeywell SOLA Control, this specially designed control panel offers remote readings of temperature and pressure gauges as well as the indicator lights for power or a call of heat and fuel on as well as failure. The SOLA Control Center also offers a touch screen display that also utilizes boiler monitoring as well as boiler control. This gas fired condensing boiler offer a burner firing shut down valve, an automatic operating gas valve as well as a safety valve. Included in the gas equipment of the Triple Flex Ultra High boiler are the high and low gas pressure switches, the pilot solenoid valves and the electric ignition just to name a few. The Triple-Flex Ultra-High Efficiency Condensing Boiler has a Lifetime Warranty Protection against thermal shock. These Bryan Boilers are the only boilers with a full non-prorated lifetime warranty. 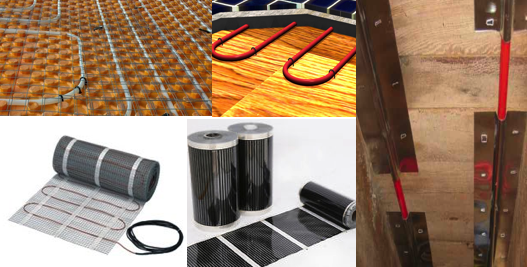 These commercial boilers are available through your local Bryan Boiler representative. Contact Bryan Boilers to find out which of the Triple-Flex Ultra-High Efficiency Condensing Boilers would work best for your commercial application.